As a mother, I want my children to know how deeply and truly their heavenly father values them as unique individuals. He loves them all the time and in all ways. Too often we focus on teaching our children their ABC’s and 123’s and overlook their deep desire and honest need to be accepted and loved just as they are now, right this second, not as the future little adults we hope they become. 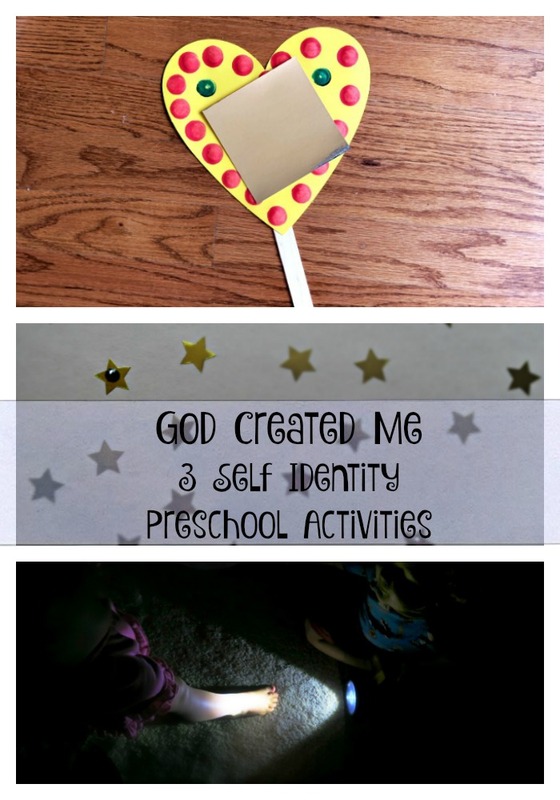 Taking a few minutes to complete the following 3 Self Identify Activities from the Christian program – Experience God, may serve as reminders to our little ones that God created them and loves them just as they are right now. He always will! Ask: How many stars are in the sky? Invite children to show you how high they can count. Work together to draw and fill a piece of paper with stars. If children are too young to draw a star shape, set out star stickers and fill the paper with stickers. 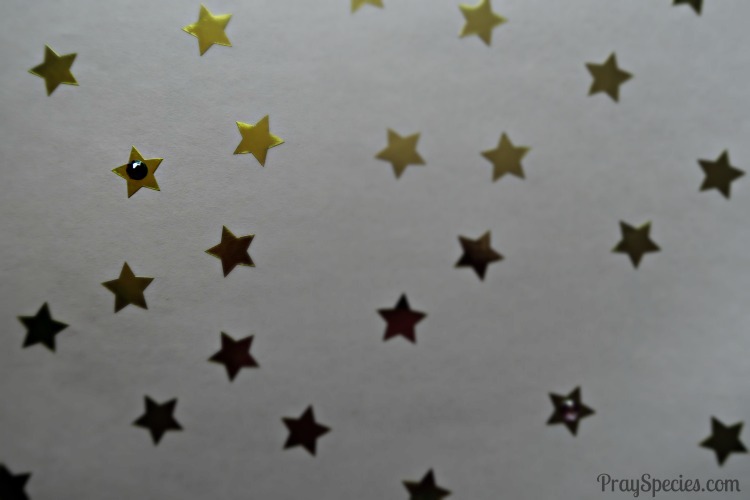 Invite a child to try and count all of the stars on the paper. Explain that God created millions of stars on the fourth day. Using white butcher paper, I covered our kitchen table and allowed my three-year-old and two-year-old to use an entire roll of star stickers. Stickers are a major favorite for us right now and the kids loved having the freedom to decorate such a large canvas. When they were all done, I told them that God had created billions of people (too many for us to count), but that each one, including them was unique. God can see and identify each of us, even when we might look the same to each other. I then asked each child to choose a star to be their star. We then placed a small sticky jewel sticker (each child picked their favorite color) in the middle of the star stickers the kids picked. We used that butcher paper as a table cloth for days until the paper started to tear and become soiled. Each time we sat down to dinner the kids were reminded that they are unique and loved by God. Ask: When do you feel the safest, in the light or dark? Shine the light on the floor and invite one child to chase the light. Move it along a path. 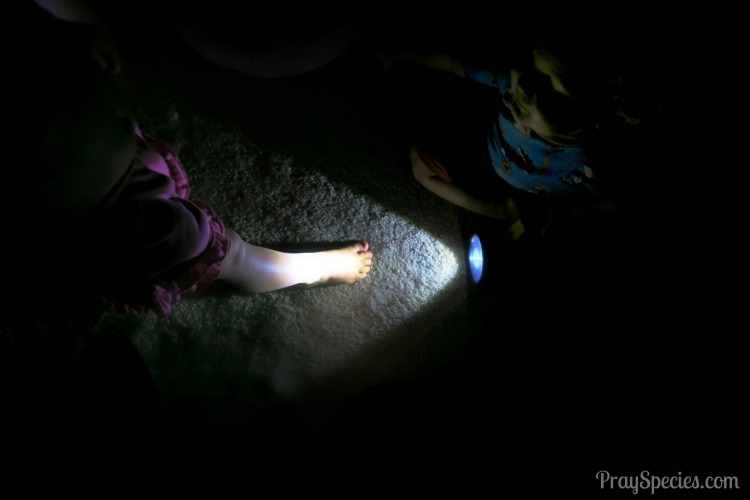 Give the child the flashlight and encourage him to shine it for another child to follow. Repeat until all children have had a turn to follow the light. The kids are very into flashlights, so they were more than happy to take turns shining a light on the ground and lead their sibling around the room. We talked about how difficult it can be find our way in the dark. I reminded them that when they are unsure or frightened, they can pray to God and ask him to show them the way. His answer may not always be as obvious as a flashlight path on the bedroom floor, but God always answers us and sometimes even uses other humans, like brothers and sisters to help us find our way. Ask: What do you see when you look in a mirror? Invite children to look at their reflections in the mirror. Take turns describing features and the associated textures. Attach the craft stick to the heart and then attach the mirror. 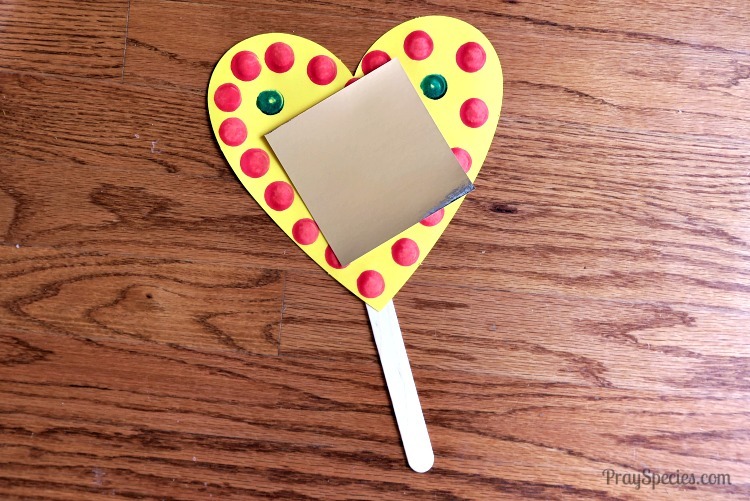 Encourage children to create texture art around the mirror with glue and the sand. Invite children to hold hands and sit for prayer. Discuss different emotions and the type of texture that might go with each emotion. (For example: angry-hot, mean-pokey, love-fuzzy). Pray that God helps our hearts be soft and ready to do his will. Optional: Give each child a cotton ball (textured hand activity) to hold as you pray. Ladybug’s God Created Me Kite Mirror. 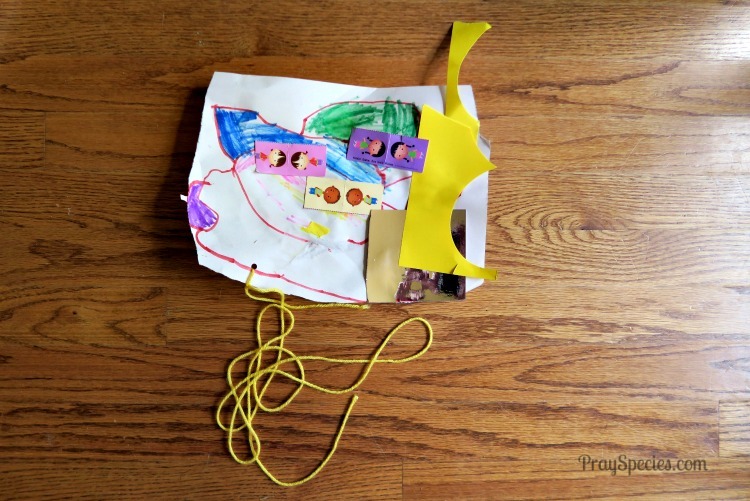 The kids and I also really enjoyed using our Truth Tunes CD from Experience God with these projects. The CD has my children signing and remembering bible verses with no effort at all on my part 🙂 I just have to push the play button. The Bible verse song: “God’s Masterpiece,” (track 11 on the Truth Tunes CD) is a perfect fit to accompany any of these activities. The image below is perfect for saving for later on Pinterest! Looking for more fun family and home school ideas? I share tons of preschool and toddler play ideas, home school activities, book suggestions, and other home school projects! The ideas presented here were inspired by “Experience God,” a Christian based program available from Mother Goose Time.